By Melissa Mulvaney, MAE, DiplAc, LAc One in five women seriously consider cosmetic surgery or other Western anti-aging treatments to “fix” her face, body. 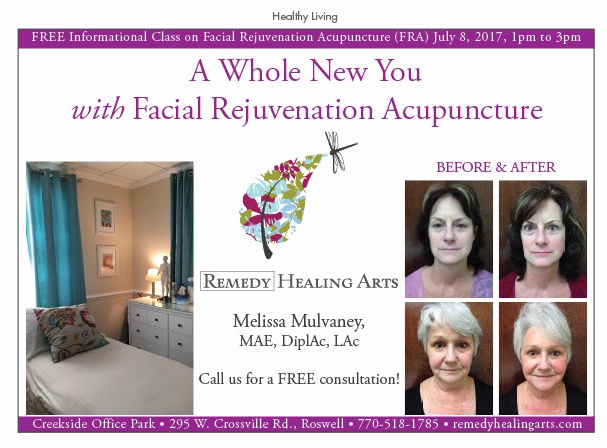 Facial rejuvenation acupuncture (FRA) has become a sought after procedure for celebrities and those looking for an all-natural, less invasive treatment without the side effects and risks of surgery, injections and peels. It is virtually painless and requires no downtime. FRA is a great option for many women (and men) seeking a refreshed look not only to their face, but to their neck and décolleté as well. Most will see five to ten years taken off of their appearance, and they can expect the results to last two to five years with maintenance. FRA is for those with fine lines, deep wrinkles, sagging facial and neck skin, dark circles, drooping eyelids, puffiness, age spots, large pores, dry skin, and acne. Additional therapies such as facial cupping, jade gua sha, tuning forks and skincare product may be incorporated into the treatment based a client’s unique needs. Different protocols may require from ten to twenty treatments. One may expect to spend anywhere from $1000 to $2500 depending on the practitioner’s rates. FRA treatments work on the causes of aging through stimulation of acupuncture points with needles on the body. The practitioner can bring blood and qi to the face, neck, and décolleté by inserting very fine needles there. This technique, also known as collagen induction therapy or micro-needling create minute trauma in the dermis of the skin making it think it’s being damaged which bring collagen and elastin to the area, lifting and plumping the appearance of the skin. Many clients are pleasantly surprised by the additional benefits of improved sleep, digestion, and stress relief. But, not everyone is a good candidate for the procedure. In general, people in poor health are less likely to see good results from FRA. There has to be a certain amount of qi, or energy, in the body from good nutrition and circulation to produce improvements. It is also not recommended for people with some other health related issues. In my office, if determined to be a good candidate, a client can expect at least twelve FRA visits which last 90 minutes each and treat the whole body – not just one area of the face. Recommendations for skincare, supplements, and at-home maintenance tools are made on an individual basis to accelerate and extend the results of FRA treatments.